Thanksgiving week is upon us. Here it is! Grant and I felt very thankful to get to visit with Dolan’s wife and business partner, Ali Marie, this past weekend as she was in Nashville. We went downtown to visit Dolan’s recent art installation for the new Omni Hotel in Nashville. The Omni is connected to the Country Music Hall of Fame (new home of Hatch show prints) and the new Music City Center convention center so we toured that, too, finally. Impressive! I put Ali Marie to work, or vice versa… we cooked up a storm, creating some side dish ideas for the upcoming holiday. Here are a few of our favorites from the weekend. This first idea came about as we were trying to find an alternate to the popular Broccoli Salad idea with cheese, bacon, and mayonnaise. I think this one was our favorite. It has a similar taste profile as the classic recipe but is made with slightly different, good quality ingredients and less fat. Preheat oven to 400. Cut broccoli into steaks about ¼” thick. Coat a baking sheet with olive oil and then spread the broccoli steaks out on the olive oil. Lightly salt and pepper. Sprinkle the onions on top. Place the cookie sheet in the oven for about 15 minutes. Flip the broccoli pieces over with a fork. 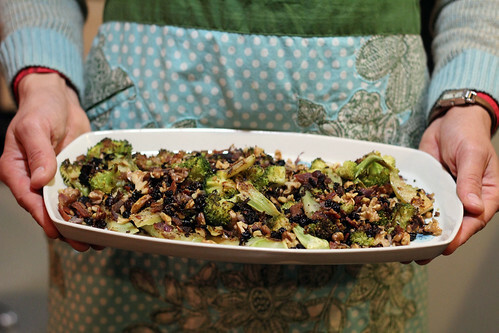 Add currants, walnuts, and bacon and cook for another 15-20 minutes. Transfer to a serving platter and serve immediately. 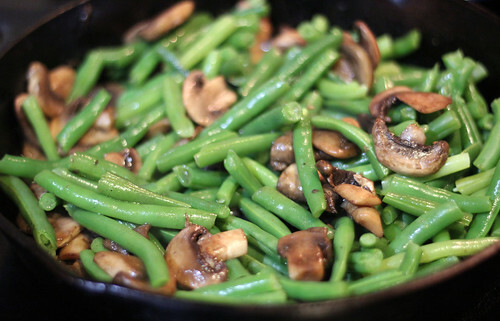 We both love green beans and talked about a million ways to elaborate on them but really, one of our favorite ways is just a simple saute with some mushrooms. Heat a skillet on medium heat. Add the grapeseed oil. Throw in Green beans. Cook for a couple of minutes and then add the mushrooms. Saute, stirring occasionally. 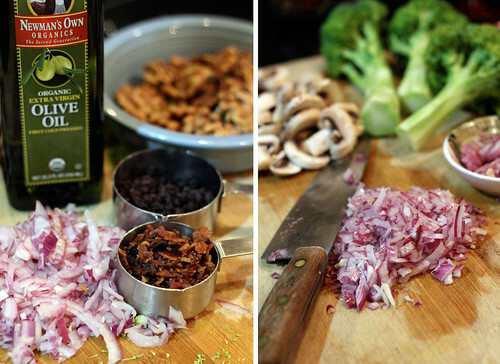 Mix the remaining ingredients together in a small bowl and then add to the beans and mushrooms. Serve immediately. The other day I couldn’t stop thinking about Creamed Spinach. I don’t think I’ve ever actually eaten it which I think is odd. Growing up, though, my Mom never served cooked spinach as she didn’t care for it. I started looking up recipes but none of them really seemed to strike a chord with me. I thought maybe a simple soup with similar ingredients might make a great starter for a holiday meal. Here is what I came up with. It was such a brilliant color of green that it seemed quite festive. Heat a soup pot on medium heat and add butter. Add the onion and cook until translucent. Add garlic. 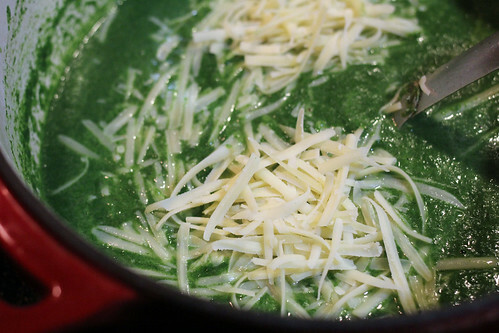 Remove from heat and blend in a blender with the raw spinach and stock. Add back to the soup pot on medium heat. Cook for a few minutes to blend. Add the nutmeg. Reduce heat to medium low. Add the cream and stir. Add the grated cheese. Stir. Salt and pepper to taste. Ladle into soup bowls and sprinkle the pancetta on top to garnish. Top with a tiny bit more Gruyere. Serve. Preheat oven to 400. Cut squash in half and scoop out the seeds. Rub with a tiny bit of olive oil and turn each face down onto a baking sheet. Roast in the oven for 30-40 minutes. Remove from the oven and let cool. 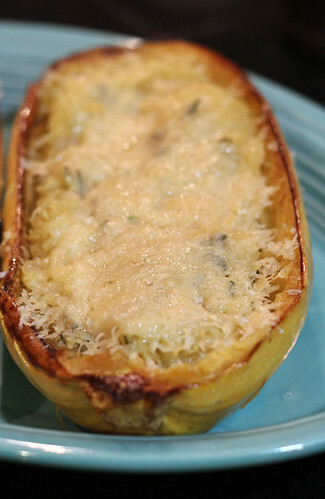 Scrape out the squash into a bowl (reserving the empty squash shells to use as a serving dish). If you can, press some of the liquid out. In a big iron skillet, heat the butter until it begins to brown. Add the sage (reserving half a Tbsp to sprinkle on top at end). 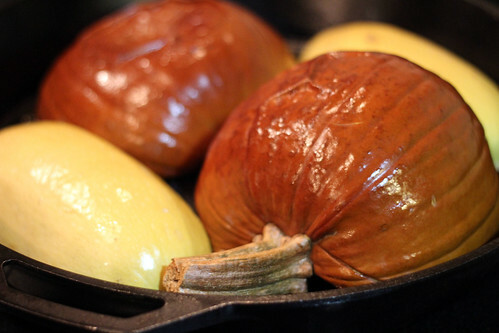 Pour the squash into the skillet and stir to coat well. Mix in all but a spoonful of the cheese. Pour mixture back into the squash shell (you will probably only have enough to fill one of the halves really full). 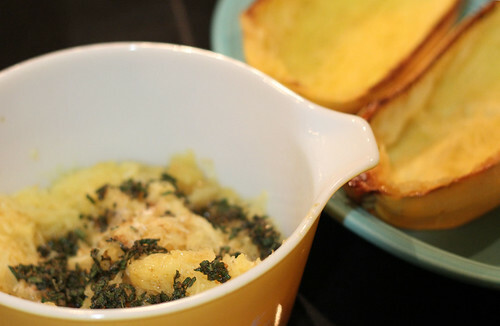 Sprinkle the remaining cheese and sage on top and put under the broiler to brown the top. Serve. 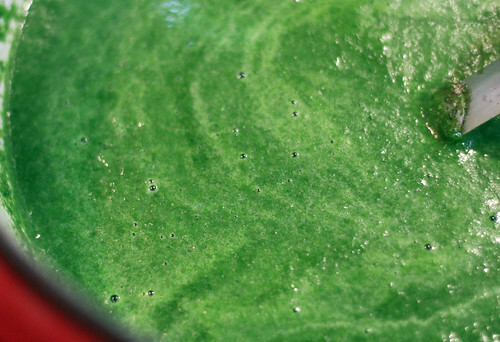 Wash the lettuce in cold water, dry thoroughly and put in the refrigerator to chill. In a large pan set over medium-high heat, fry the bacon until it is nearly crisp, then remove to a bowl. Drain off all but one tablespoon of fat, then add the bread cubes to the pan and toss to coat. Bring heat to low and toast, tossing the bread occasionally with a spoon until it is crisp. Place in another bowl. Place a whole egg in its shell into a coffee cup, then pour boiling water over the top. Allow the egg to cook for 60 seconds, then remove it. Rinse with water until cool. In a mixing bowl, whisk together the lemon juice and olive oil, then crack the coddled egg into the bowl and whisk again, vigorously, to emulsify. Add salt and pepper to taste, then set aside. In a salad bowl, combine cold lettuce, shallots, mint, oregano and the reserved bacon. 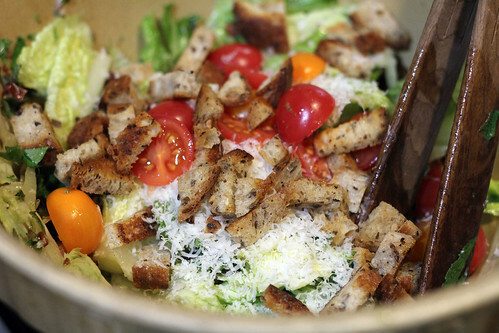 Toss with enough dressing to coat the lettuce, then top with the tomatoes, the croutons and the cheese. I’ve posted this pie before but I made it again this weekend and it was so good that I wanted to repost. Also, I made a few slight changes. This one is a winner! Please be sure to make your own, homemade pie crust. 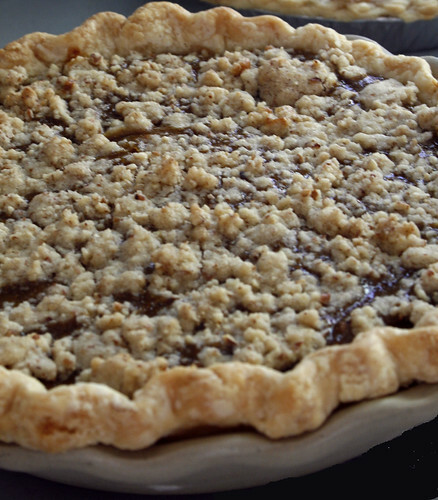 You can find my pie crust recipe and a few other dessert ideas from a couple years ago here. Preheat oven to 400 degrees. Cut the pumpkin open and into four wedges, clean the seeds out (I roasted them up with a little salt for a yummy snack! ), cut the strings out and rub the inside with a little olive oil and place face down in a baking dish. Bake for about an hour, until the pumpkin is tender when forked. Once cooled, scoop out the flesh. Preheat oven to 425 degrees. Stir together brown sugar, salt, arrowroot. Add the pumpkin, vanilla, and eggs and mix well. Add the coconut milk. Puree all the ingredients together in a blender and then pour into the unbaked pie shell. Bake for 15 minutes and then turn oven down to 350 degrees for another 40 minutes (set timer for 20 minutes, though, as you will need to add the crumble top!). Make the crumble top. Ground roasted pecans in a food processor or chop very finely. You can add the other ingredients to the food processor or mix by hand. Be very careful and open oven door and quickly crumble the topping over the pumpkin pie. Bake for the remainder 20 minutes or until pie is set. I want to close with a musical suggestion from our family to yours— Grant and I have tried to make it a tradition to watch the musical documentary, The Last Waltz, every Thanksgiving since it was released on DVD back in 2002. This Martin Scorsese film is the documentary of The Band’s farewell concert from Thanksgiving in 1976, that featured some great special guests including Neil Young, Bob Dylan, Joni Mitchell, Emmylou Harris, Van Morrison, the fabulous Staple Singers, and so many more. The music of The Band has had such an impact on us and so many of our musical friends. This collection of songs makes me very happy. Here’s a clip from youtube that I found of one of my absolute favorite songs from the film. If you haven’t seen the film or ever listened to The Band, I suggest you do.